We started with a Tuesday press advisory which included AC and AOPA—Senator Bob Kerrey, Charles Dankmeyer, Adrianne Haslet, Drs. Paul Pasquina and Stephen Fisher, and Amputee Coalition President Dan Berschinski. It began the tide of press interest which carried over to the August 26th events. The DME MAC hearing attracted roughly 200 amputees, to hear 81 witnesses speak for 3 minutes each—roughly 50 addressing prosthetics and ALL opposing the DME MAC proposal. AOPA President Charles Dankmeyer, CPO, Tom Watson, CP, Boston Bombing Amputee Adrianne Haslet and Executive Director Tom Fise each made presentations for AOPA. Spirits were high as the DME MAC Medical Directors listened without comment or note-taking to 5 solid hours of presenters. 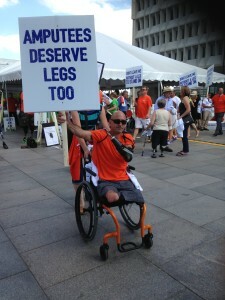 The scene shifted to the Amputee Patient Rally at the HHS Headquarters. Approximately 150 amputees attended, carrying signs, marching, chanting, and sharing stories (see photos below). Last week, AOPA Executive Director Tom Fise had written to HHS Secretary Burwell, informing her of the planned rally, and offering to meet with her. It came as a surprise when late Tuesday night, NAAOP Counsel Peter Thomas and Tom Fise received a reply offering a 4 pm meeting to 8 individuals with CMS Administrator Slavitt, the Senior Counsel to the HHS Secretary, Kevin Thurm, Deputy CMS Administrator Sean Cavanaugh (AOPA had met with Mr. Cavanaugh previously, on August 11) CMS Chief Medical Officer Patrick Conway, MD, And HHS’ Sharon Lewis along with other senior officials. The O&P community was represented by 5 amputees among the group of 8 which consisted of: AOPA President Charles Dankmeyer, CPO; Tom Watson, CP; Adrianne Haslet, NAAOP President Dave McGill, Jack Richmond and Sue Stout from the Amputee Coalition, NAAOP Counsel Peter Thomas and AOPA’s Tom Fise. The group had a good, and hopefully productive meeting with CMS/HHS folks. The official CMS press release can be seen (below). From AOPA’s perspective, CMS officials underscored that cost and financial concerns are not an appropriate basis for writing or changing an LCD, and that such decisions must have a strong evidence basis, and that assuring high quality of patient care for Medicare beneficiaries is a paramount concern. Some strong attention focused on the letter from researchers (Jim Campbell, PhD, CO; working with Wendy Beattie, CPO; Gary Berke, MS, CP; Jason Highsmith, PhD, DPT, CP) and others had prepared and presented at the DME MAC session a powerful statement which was shared for the CMS/HHS officials, and the asserted absence of evidence-based rationale. The CMS officials indicated that there will be follow-up conversations with the DME MACs, and if those discussions lead to strong emphasis on evidence and high quality patient care, I think it would point to a very different kind of LCD, one that may prompt some of the concerns expressed in various forms yesterday to be allayed. The rally and other events surrounding the LCD policy have been heavily featured in the media. Below are some photos and links to the media stories generated. Today, senior officials from CMS and HHS met with individuals and representatives of groups concerned with a recent policy proposal issued by regional Medicare payment contractors regarding coverage of lower-limb prosthetics. 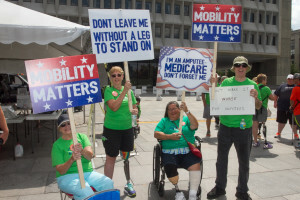 CMS and HHS officials expressed the critical importance of Medicare beneficiaries’ access to appropriate and medically necessary lower-limb prosthetics, and appreciated hearing personal stories and comments on the proposal from the group. As the proposal is still open for public comment, CMS and HHS officials stressed that stakeholders’ input was vital to the process as the Medicare regional payment contractors finalize a new policy. CMS officials said they would work with the regional contractors’ medical directors so that any final policy is supported by clinical evidence and does not limit necessary services for Medicare beneficiaries. 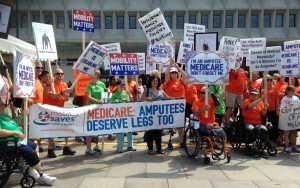 Cherokee (GA) Tribune – http://cherokeetribune.com/view/full_story/26828465/article-Amputees-decry-Medicare-payment-overhaul-for-artificial-feet-?